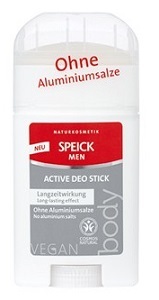 Speick Men Active Deo Stick has been formulated with deodorizing organic Sage to provide reliable deodorant protection and a long-lasting, invigorating and active freshness. The natural, effective formula lets the skin breathe while controlling perspiration. This Vegan product is gluten-free and lactose-free, and contains no Aluminum salts, synthetic fragrances, artificial colors, parabens, mineral oil-based ingredients, or preservatives. This product has been dermatologically and allergologically tested and approved.